Yes, more than one glass for beer exists (And I’m not talking about different logos) and more and more I’m noticing pubs actually carry them. And while they do look nice and pretty, they are varied for a reason. This post will go over that reason and list off some glasses along with which beer styles go with them. So to put it as basically as possible, the glasses help bring out the best in your beer. If you want, think of a glass as a suit or dress that just suits you SO WELL and calls attention to all the right parts, showing no flaws. That is the job of the glass. To get in to specifics, similar to wine glasses, different types of beer glasses help compliment different styles. With the right combination of beer and glass, the aroma, taste and steady carbonation of the beer will be greatly complimented. So tell that to your wine snob friends next time they laugh about how unsophisticated beer is. Perfect example. It was a warm summer day and my mother and I were in a pub. She wanted something light and crisp, so she ordered a Pilsner Urquell, which was served in a Pilsner Flute Glass (see picture above). She adored the beer’s crisp flavour, biscuity aroma and to top it off, she was refreshed by the end of it. Fast forward a month later, she’s at home and feels like another Pilsner Urquell, so she gets a can from the liquor store. We don’t have any flute glasses at home, so she picked a random one, an Abbey Goblet (also above) and in her own words “it smelled and tasted like piss“. So once again, the right glass for your beer will REALLY help bring out it’s best qualities and have you strongly consider a second date, er, tasting. So where can you get these fancy glasses? Well, there are plenty of ways. Ebay is a good bet. So is contacting the breweries individually or kitchen stores and the like. And yes, there’s the dishonest way (and as it happens, my late grandfathers preferred way) of just swiping them from a pub. But that is dishonest and you should at the very least offer to buy the glass from them. And now, because knowing is half the battle, I’m going to teach you about some of the more common glasses you’ll find in pubs and what should go with them. For pictures, see the picture/chart above. Keep in mind that there are many different styles of the different styles of glasses. A flute glass can be stemmed or not, for instance, and a particular beer needs a specific one of those and so on. SNIFTERS: Not just for rich guys with a passion for Brandy and cigars! Beglian ales, Barley wines and Imperial IPAs are great for this glass and really brings out the aroma. Suggested beers: admittedly, Delirium Tremens is the only beer I’ve had with this glass. But damn, it’s lovely. TANKARDS: For when you want to quench your thirst after a bloody battle. Suggested beers: WHATEVER YOU WANT, YOU’RE A VIKING RAAAAAAAAAAAAAAAAH. Seriously though, see above in the pint glass bit. I find those go really well with a nice Pewter Tankard that’s been left in the freezer for a bit. And that’s all on glasses from me at the moment. Hope it was enlightening! 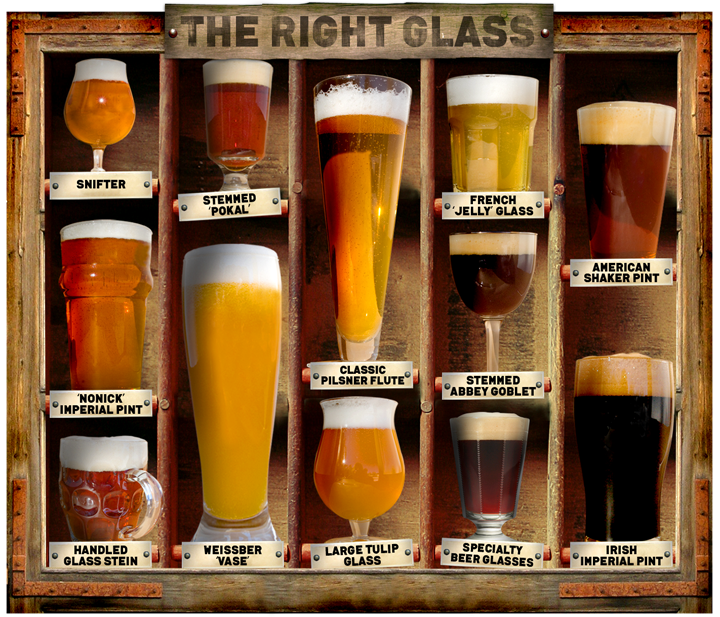 And now you know what glass to expect for which type of beer!